Camping for Beginners – never been? Go for it! Revving up for our Travel Hag Campout this weekend in Janes Island, I discovered many of my hag friends have never been camping and are daunted by the thought of living outside with bugs and dirt with no place to pee. Camping is easy, especially with the great gear available to ease the discomfort. You can be as rugged or luxurious as you want to be. The gear you take determines the ease of the experience. We use our r-pod camper now that we’re experienced campers and we have a lot of gear. It’s easy to stow your gear in the camper and hook it up whenever you’re ready. Tent camping takes more preparation but is perfect for the beginning camper. It’s easy to erect a tent and pitch camp, and there are products out now that allow you to sleep off the floor, stay dry and be able to keep out the bugs and dirt. Tent camping is super easy. But more than being easy, tent camping can be magical. Some of my best camping memories are when Dan and I tent camped. You have more flexibility for a remote site. In the photo above we were able to pitch our tent and camp right on the Madison River, looking out on the snow-capped Rocky Mountains. These wilderness sites cannot accommodate the large campers and trailers. The scenery, the night sounds, and the night sky is spectacular in these remote sites. 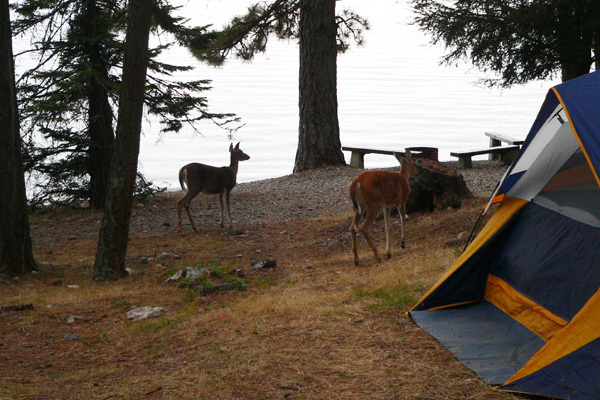 Tent camping is also affordable for individuals and families. 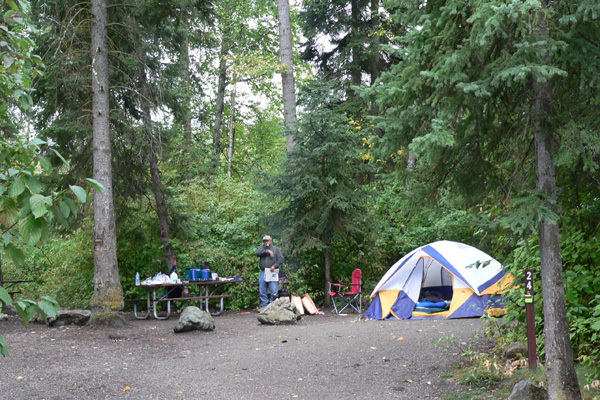 The average fee for a tent site in a state park is about $25 a night. Once you make the investment in a good tent and good gear, you can reuse it for years, and camp for a fraction of what hotels or motels will charge. Tent camping allows you to feel the outdoors at night, hear the sounds of the woods, see the galaxies above usually in a brilliant context due to the lack of city light. A tent is just where you sleep, and the options out now allow for that to be a comforting experience. Tents are easy to put together, easy to store, and easy to carry. “Flies” that go over the top of the tent keep the rain out as do the new water-resistant canvasses. It’s not impossible to get wet in a rainstorm, but much less probable. Here are some camping tips for first-time tent campers. You get what you pay for. Buy a cheap tent and it’s likely to leak in the rain, tear when stressed and have the poles or accessories break. I’ve so many friends who learned this the hard way. Order a tent online or purchase one at a store specifically for the outdoors such as Gander Mountain, Dicks Sporting Goods or Bass Pro Shops. Consider spending between $100 and $200 (one night’s stay at a nice hotel). Get a roomy tent – Get a 4 person tent if there’s only two of you. This travel hag is too old and creaky to be squashed into tight quarters. Tents don’t have to be uncomfortable, and the last thing you want to do is step on sleeping bags and pillows searching for the flashlight or batteries. You need someplace to stow gear and sit if it’s raining. One tent I particularly like is the Kelty Yellowstone. You can fit two cots on each side, have room for gear and the mesh top allows you to see the stars at night. Also, it’s got taped as well as stitched seams which keep you dry. Invest in a cot and or air mattress. Nothing is fun or exciting about laying on the hard ground or rolling over and feeling a tree root in your back. Also, I detest having to get up from sleeping on the floor – or at floor level. There are cots that keep you off the ground and Cabels’s has a cot with a twin air mattresses attached. This is comfy, keeps you off the floor and allows for a good night’s sleep. Setting up a tent is easy. It’s basically done by sliding flexible poles through sleeves, standing the tent up via the poles, staking the corners to hold it in place, then putting a fly (covering) over the tent out the effects of wind and rain. It is generally the job of two people, but I love this 1:29 YouTube video on setting up a tent which shows one guy erecting a family size tent. You can see how simple the process is. Before you start to pack, decide what you will eat for each meal. Make a grocery list. If you need ideas check some online camp recipe links. Two good ones are Camp Recipes and Quiet Journey. Also, my favorite hard copy camp recipe book is Camp Cooking; 100 Years put out by the National Forestry Service. Tent camping became too cumbersome for Dan and me – not because of the discomfort, but because of the amount of gear we had to schlep. Remember to keep your gear to a minimum because you have to unload and put away all that crap when you get home. Plus it takes up an enormous amount of room in the car. Here’s the camping checklist I used when tent camping (before things got out of control and I started adding everything but my kitchen sink). 2 air (twin) air mattresses (This travel hag is okay with a bit of distance between my grizzly man and me). Cooking and prep utensils – knife, cutting board, bowls, cooking spoons, spatulas, pots, pans (this list is made based on the menu you’ve planned). I like Lodge cast-iron ware. This may sound dumb, but some people just set out for camping and don’t consider what they’ll do, and frustration sets in when two people have to decide on what to do – particularly if you haven’t planned for inclement weather. If your preference is to simply enjoy the outdoors from your site, read, take a walk, nap, fish … that’s great. Then PLAN to do that. If you’re on a weekend camping trip, Friday and Sunday will include setting up and taking down camp, so other activities should be limited. Saturday is your big day. 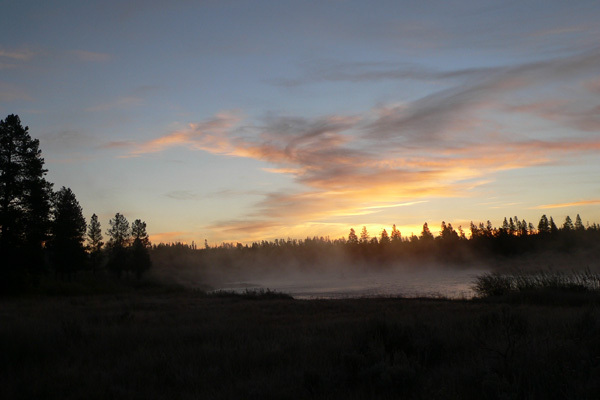 Scope out the activities available at the campground and surrounding areas and make a list of possibilities. Be sure to choose some for rainy weather. The most stressful part of camping is setting up camp. This is the time you’re most likely to have a fight. So talk about it. Have a drink before you start. Smile at each other, hug and commit to being patient.